I have another exciting interesting hobby, playing Blackjack. On a recent holiday in a casino resort, I met some friendly ladies over the table games. They asked why I always had luck with my playing and not them. This was what I shared.... Gambling is like business. In order to do well in business, everyone needs these four elements of life. They are Skill, Emotion, Braveness and Luck. If you know how to capitalize on the first three elements, Luck would come gradually. Of all the various games available in the casinos, I pick Blackjack because the probability of winning is greater than all gambling games. Meaning, the risk factor of losing is at the lowest. Is also a game of thinking and mind boggling, when at the same time allowing me to distress myself. In order to play Blackjack one has to learn either through friends or buy all the books pertaining this game. 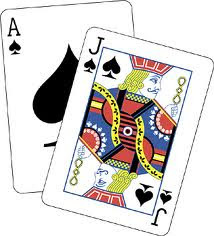 A good skillful Blackjack player has the ability to card count as the flow of cards are dispatching from the deck shoe. His memory has to be sharp and good. He knows when to draw or not to draw unnecessary cards. He knows when to bet to his favour and when to stop when his chances are low. However skill alone isn't enough to let him win because he must know how to control his emotion at the same time. When he is playing on the table, there bounds to have many distractions which might disturb his thought. Emotion is feeling and when his feeling is unhappy due to outside factors, his playing skill could be affected as well. So he has to control and manage his emotion in an ideal manner while playing a good set of game to win. Next! The winning player has to be brave and has plenty of guts, especially when he could sense his cards are to his favour. Of course, not forgetting he still needs a lot of luck to win too. Like I said earlier, when he could balance the first three elements, he believes luck would naturally come. Those attractive ladies believed all I had spoken. If you don't, buy me a trip for a holiday and I'm too willing to share my heart to you. Ah! Remember, these four elements of life, Skill, Emotion, Braveness and Luck are always needed in everything we do. In business or raising a family. Try please!